Finally! This blog entries of mine require not only that I first get the items and use them, and then write the blog, but also I need to take pics... I rarely use the listing pics, mainly because even the photographs the sellers use are amazing, they also are their intellectual property, and I'd also rather take my own. I like taking photographs, and I'm slightly moving from the beginner stage to the obssesed amateur, and taking pictures of all the beautiful things I get is quite an amazing exercise for my photography. The lil problem of getting more involved into photography means I like to stand more behind the camera, and less in front of it. But, now with my shiny new gorillapod, I have a helping hand with the self-photography. 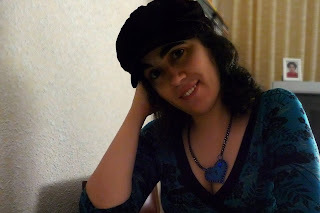 My delay with writing this blog entry has been caused exactly by the lack of proper pics to show off the adorable necklace I got from Mary from Black Kitten Accesories! 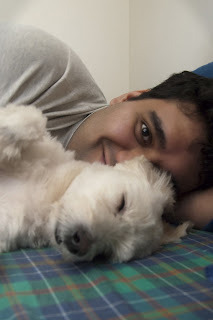 But yesterday, I got an idea after taking pics for my Sunday shot, and even if the light & quality was not the best, Gaurav managed to edit them enough to be not-too-bad-to-be-used. I met Mary through DIYScene, and got along with her great, although truth be told, who wouldn't!? She's a wonderful, talented crafter, and huge animal lover! Her etsy shop, Black Kitten Accesories, offers a range of handmade accesories, like pendants, necklaces, earrings and bracelets, with a perfect mix of cute & creepy! 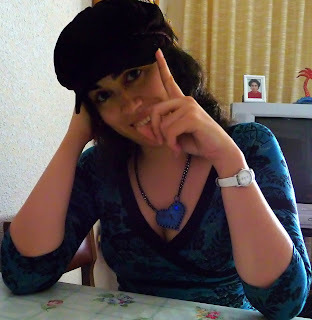 Here you can see me wearing it, and you can see it is the perfect size for a pendant! Make to stop by Black Kitten's shop, since she's offering a 75% off on her SALE section! And stay tuned for more blog entries some time this week! Well, for once we've managed to finish our self-portraits well before midnight, and since I have a working laptop now, I'm gonna be posting them on Sunday properly! For this week's shot, I finally used my new gorillapod! Stay tuned for more next Sunday! Last Saturday my HP laptop decided to die without warning, so I couldn't work on that week's Sunday Shots blog entry, so now, after getting a new lappy, I'm doing a combined entry for both weeks! My friend Irene had her 26th birthday this last Monday, but she celebrated it last Saturday, and took a bunch of is for dinner at Gino's (gotta love Italian food!) 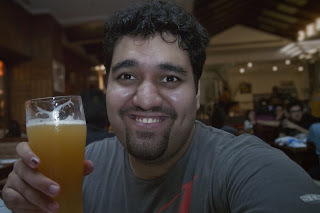 and then we went out for a few drinks and a lot of fun! I've been trying to get as many handmade presents for every birthday as possible, and in Irene's case, it was not different, and I managed quite well, except for a kurta that I bought for her in my last visit to India, the rest of her goodies were handmade! First of all, the birthday card! 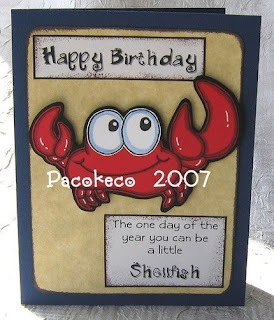 I got a few of these from Pacokeco's shop on Etsy, but I can only use them with Gaurav's family or those friends that are fluent in English and wouldn't mind a card in English. I haven't found any really nice cards in Spanish on Etsy, but I guess I can always ask for a few custom made ones... I know the lady behind Pacokeco would gladly get at it! I love her shop, it's full of fun and cute cards, tags & the cutest paper nummies ever! And her customer service is more than amazing too! Next, I gave her the Tea Tree & Lime facial soap sample from Spa Therapy that I got from the EGCG Swag Bag, cause we had talked about her wanting to try a new soap for her face, and I thought she'd love it! First thing she did when she opened it was smell it, and then everyone in the table was also smelling the soap! It does smell great, but it was a bit of a weird sight at the restaurant! And her favourite present was a Dolly bag! I got her totally addicted to Dolly bags last year when I got her a Dolly bag as b-day present, and since then she's been making wish lists of Dolly bags like mad! I got her a laptop bag for Reyes and now a Perfect Purse for her b-day! As every owner of a Dolly bag (or usually more) says: "You can't have just one!" And even if it was not handmade, she also loved the kurta I got her! Well, finally! After almost a week without laptop and without net, and about to have a stroke! I finally decided to get myself a new laptop while I get my old one fixed, so I can always have a back up from now on! 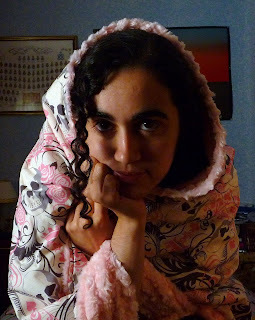 In the meantime I have been taking some pics for new blog entries, and this is the first one of the list! I met the adorable Krissy of Absidy Jewellry through DIYscene, and saw how amazing her jewellry creations were, and finally went ahead and bought two necklaces I had been eyeing for quite a while! You can find her not only on her Absidy's Etsy shop, but also on her darker side's shop: Absidy's Revenge, and also, check her blog, for news and sneak peeks at what she's working on! Now, I'm gonna be showing off both my purchases! Stay tuned for more blog entries during the weekend, both here and in the Two Girls And A Bar of Soap blog! Have you ever had one of those days when you've barely sleep, but have managed to have a very productive day, and for some reason you're feeling full of energy? Well, I'm having one of such days! I worked night shift last night, and after that I went to visit a friend of mine that works in a bank, to ask for help with my taxes. Got that done (yay!) and found out I'm getting a juicy tax return (YAY!!) that I'll be using to pay for my future new camera, the Olympus E-620! Now after that, I arrived home around 10'30 am, keep in mind I had been awake since Tuesday at noon, and arrived home, got another potential brilliant piece of news, and then proceeded to take a nap, in the sofa, with my custom made, awfully brilliant RockerByeBaby blanket! 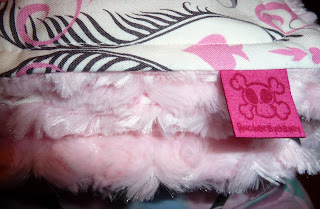 If you've read my blog before, you surely have seen other reviews & entries about RockerByeBaby, but for babies stuff, so you'd be wondering why am I reviewing now MY blanket? Well, after buying RockerByeBaby gear for Rudra, particularly two blankets, and feeling how amazingly soft and snuggly and warm they were, I got envious, and decided that I wanted one of my very own! 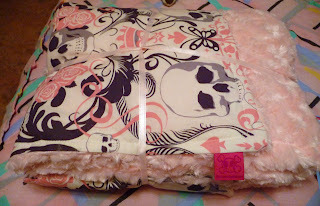 Amber offers also custom made, adult sized, throw blankets, so I contacted her and after choosing the print and minky fleece, I was on my way to waiting for my very own RockerByeBaby blankie! It's truly glorious, soft, snuggly, warm and squishy! 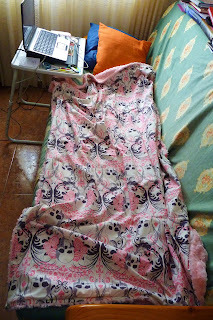 And it fits perfectly not only on my single sized bed, but also on my sofa! And it's also the perfect selfish blanket, cause it only fits one! If you too are envious of the awesomeness of the blankets for the babies, indulge yourself in a custom made one, and you'll love it as much as I do! Feel free to give your opinion in the shots, and keep an eye open for next week!